St. Patrick’s Day is on the horizon & here at Cashel Travel we're planning our celebrations. With this in mind, we thought we’d explore one of Dublin’s best spots: Temple Bar. Imagine the best that Dublin city has to offer - pubs, restaurants, galleries and music - all gathered together in a few cobbled streets. This is the cultural heart of Dublin city. Temple bar has always been a popular spot, the Vikings set up camp on the bank of the Liffey there as long ago as 795 AD. The remains of the Viking settlement can be seen in Dublin city castle today. Fast forward a few hundred years and the British diplomat Sir William Temple built his grand residence and his gardens and fixed the name, Temple Bar. A real treat can be had at The Clarence Hotel tearooms. A lucky visitor might even see the owners, Bono and lead guitarist from U2, The Edge. Wandering the cobbled streets delicious scents draw you to the doors of the many restaurants with their mix of international and local flavours. From The Chameleon serving contemporary Indonesian cuisine to the Italian restaurant Il Baccaro located in an eighteenth-century wine merchant's cellar. For traditional Irish food, the best place is The Quays Irish Restaurant where the specialities include Guinness stew, Dublin coddle and the famous Wicklow lamb shank. A hearty meal can be had at any of theses places before an evening of music in Temple Bar’s pubs. 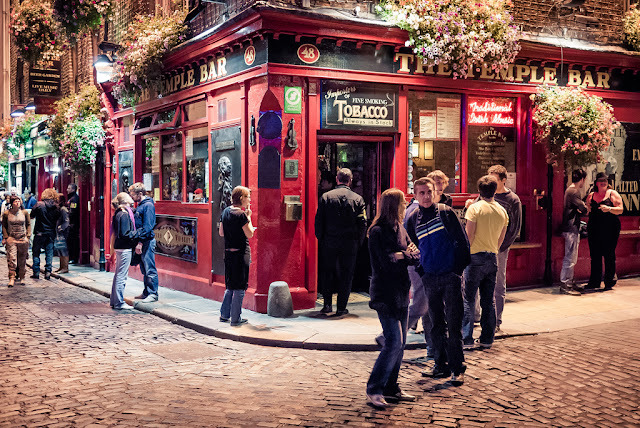 Temple Bar is the city’s playground on the South Bank of the River Liffey. It’s crowded with cafes, pubs, galleries and music hubs. It’s the beating heart of Dublin city at any time of year. Buskers and street artists entertain locals and tourists alike, filling the streets with music and dazzling shows. But that’s not all. An array of markets from fresh and local foods, antique books and the latest page-turner novels, to a designer market showcasing the best of handmade craft and design produced by Irish artists. Away from all the hubbub is the ‘Old City’ area of Temple Bar with its sophisticated calm of independent boutiques, stores and cafes. Perfect for a quiet stroll and a cup of coffee. 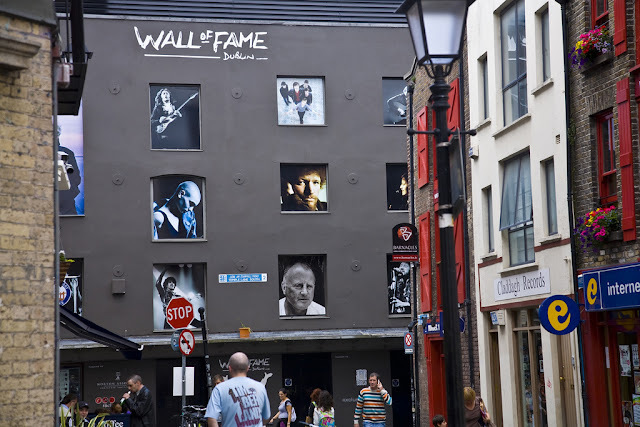 Numerous galleries line the streets, including Temple Bar Gallery and Studios, one of the largest gallery/studio complexes in Europe. More than 30 artists work here on a variety of contemporary visual arts from sculpture and painting to printing and photography. The National Wax Museum giving a wax representation of Irish history, politics and sporting events. Temple Bar has the most pubs in Dublin so it’s no surprise that as the sun goes down the volume goes up. Street musicians play their hearts out to the revellers who jump from pub to pub. The lively strains of traditional Irish bands tempt anyone into the bars for a pint and a dance. Some of Ireland’s best musicians gather here to share their love of music. The Oliver St John Gogarty offers traditional music at every hour of the day and night. While Cassidy’s Bar, renowned for Bill Clinton’s visit in 1995, is a real Irish bar with a bohemian atmosphere, a jazz basement, a piano bar and, of course, traditional Irish music played regularly throughout the week. Another favourite is The Vat House Bar, that got its name from the vat house in the Guinness brewery where during the first phase of Guinness brewing it is stored in large vats and left to mature. The interior of the bar reflects this maturing and developing process, with timber floors salvaged from the original St. James Gate Brewery. The Brazen Head is Ireland’s oldest pub, dating back to 1198, and has a timeworn sense of history within its walls. Its past patrons have included literaries such as James Joyce and Jonathan Swift, as well as revolutionaries like Michael Collins and Wolfe Tone. The Brazen Head is the authentic Irish pub experience and well worth a visit for anyone in Temple Bar. 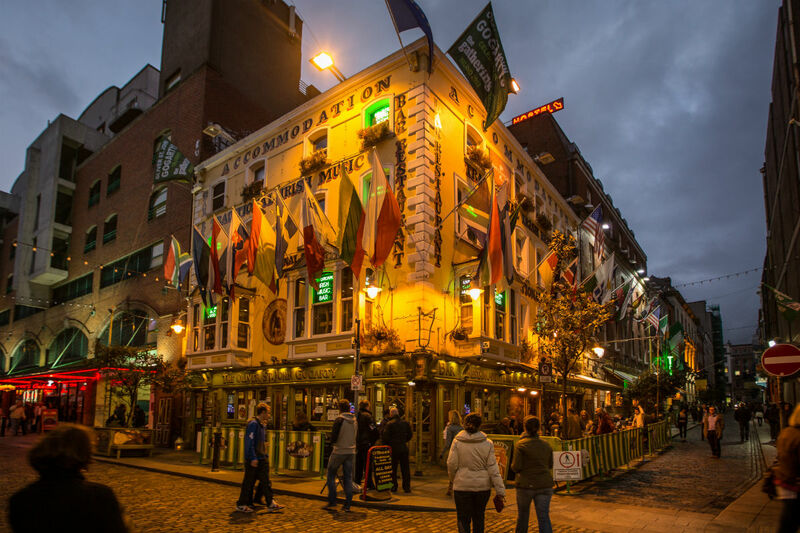 The nightlife in Temple Bar is known to be the best in Dublin, and even more so on March 17th, St. Patrick’s day and Ireland’s national holiday. And it’s just around the corner! 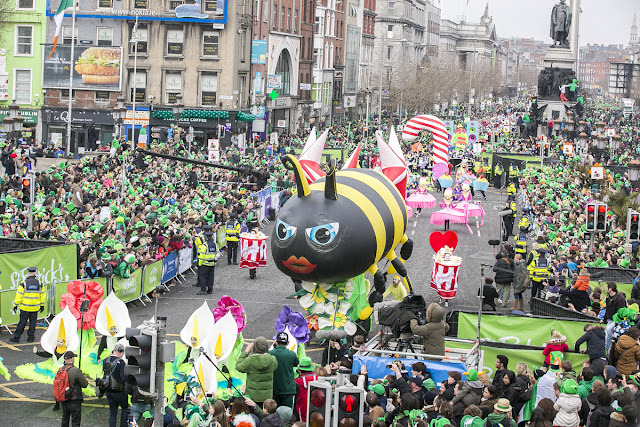 By midday, the streets are full of people celebrating and you can be sure the main colour they'll be wearing is green. 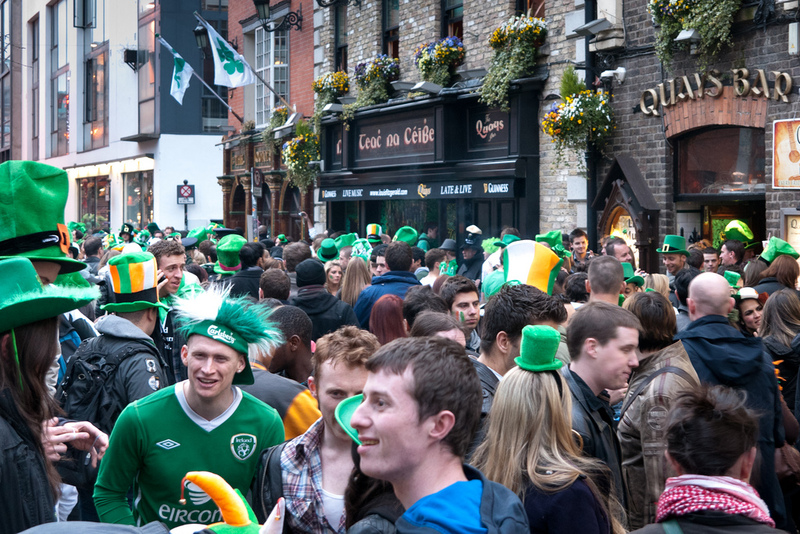 The St. Patrick’s Parade goes right past Temple Bar and it’s easy to catch a glimpse from many of the cobbled streets. This year the parade will be brought to life by leading pageant companies presenting their fantastical creations and thrilling performances to excite the crowds. Amid the colourful pageantry bands from the USA, Mexico, Germany and Ireland will play uplifting music. It is set to be a memorable event. St. Patrick’s Day showcases the best Irish music, culture and history, but all this is available at Temple Bar at any time of year. Luckily at Cashel Travel we arrange custom tours to the vibrant capital.